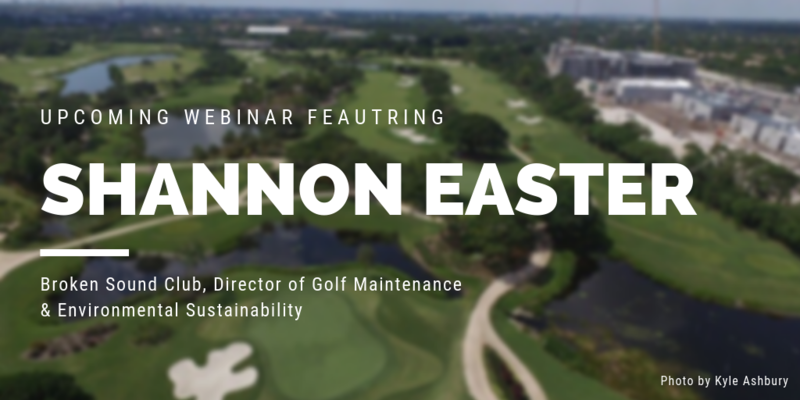 Holganix CEO & Founder, Barrett Ersek interviews Shannon Easter, Director of Golf Maintenance and Environmental Sustainability at Broken Sound Golf Club in an upcoming, FREE webinar. On October 4, 2018 at 2:00 PM EDT, Holganix is hosting a FREE webinar featuring an interview between Holganix CEO & Founder, Barrett Ersek and Shannon Easter, the Director of Golf Maintenance and Environmental Sustainability at Broken Sound Golf Club. The webinar is entitled “Turf Talk: Interview with Shannon Easter” and will consist of a 35-minute discussion one (1) sustainability trends in the golf industry and (2) Easter’s results with Holganix products at both of Broken Sounds’ golf courses. Holganix is a manufacturer of plant probiotics that harness the power of soil microbes to build strong, resilient turf and plants that require fewer fertilizer and pesticide inputs. Broken Sound Golf Club is an award-winning, exclusive golf and country club in Boca Raton, Florida. Easter has been in the Golf industry for 20+ years and has been at Broken Sound since 2013. In 2016, he was named the recipient of the Environmental Leaders in Golf Awards (ELGA), an honor co-sponsored by the Golf Course Superintendents Association of America and Golf Digest. Attendance of the webinar is capped at 100 attendees; register for the webinar before space is filled. Holganix is a manufacturer of plant probiotics that harness the power of soil microbes to build strong, resilient turf and plants. Holganix products allow professionals to reduce fertilizer and pesticide inputs, providing high performance, yet sustainable results. Holganix products are used by over 500 golf course superintendents in America.